A bill to make the Sunshine State the 46th to grant the public open carry of firearms passed a House committee Tuesday with support of several sheriffs. 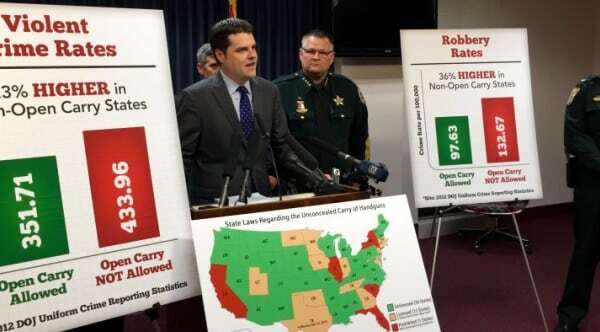 The proposal, introduced last month by Rep. Matt Gaetz, R-Shalimar, won easy approval from the House Criminal Justice Committee in an 8-4 vote roughly along party lines. On hand to support the measure was Brevard County Sheriff Wayne Ivey and representatives of Wakulla County Sheriff Charlie Creel, who contend open carry can help discourage crime. 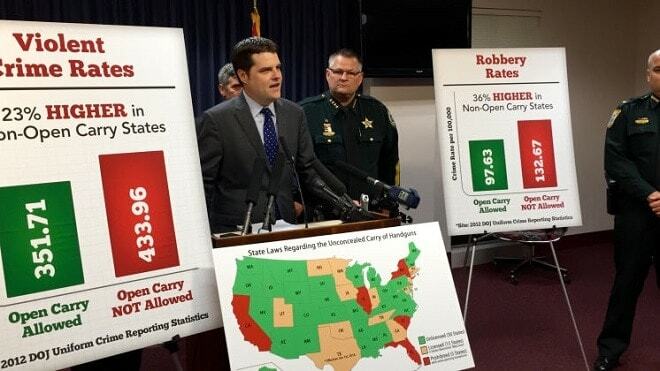 Gaetz’s legislation, HB 163, would allow the state’s 1.4 million concealed carry permit holders to openly carry a firearm. Despite some of the most pro-gun laws in the country, Florida is but one of five states in the nation to prohibit the open carry of firearms altogether. Opposition from state Democrats is palpable. Gatez, who has signed up more than 1,000 citizen co-sponsors to the legislation, also enjoys support from the sheriffs of Bradford and Pasco counties as well as from gun rights groups such as Florida Carry and the National Rifle Association. HB 163 has to pass two further committees and the full House to advance out of the body. A companion measure, Sen. Don Gaetz’s SB 300, is working its way through the state Senate.